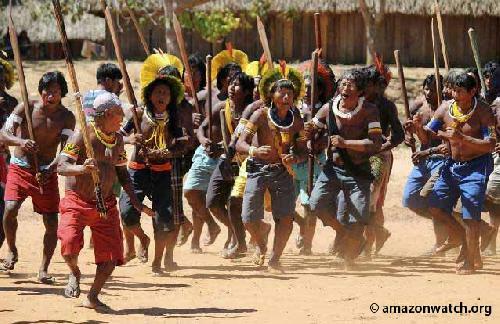 The Mebengôkrés warriors (Kayapos) have massively demonstrated in front of the city Council of Colider (Mato Grosso – Brazil), 3 June 2011, to show to the President of Brazil, Dilma ROUSSEF, that she did not make the Chief Raoni cry as it has been said by the press after the announcement of the authorization granted for the construction of the Belo Monte dam. The purpose of this demonstration was to show that Raoni remains steadfast/firm and strong in his struggle against the dam project on the Xingu river. 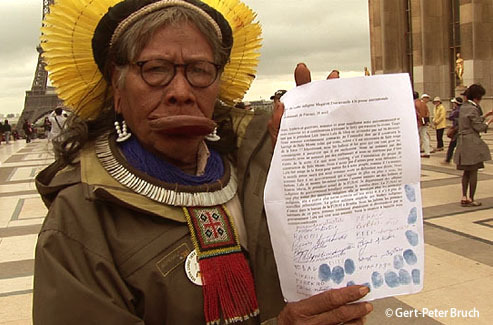 “I did not cry because of the authorization for construction and the beginning of the work of Belo Monte. As long as I will live, I will continue to fight against this construction. I want to tell President Dilma, to Lula, to the President of FUNAI, to the President of IBAMA, to the Minister of Energy Lobão, that I am on my way to Brasilia and that I will take along all my warriors to fight against the Belo Monte. I will not stop. It is President Dilma who will cry, not me. I wish to know who published this picture and spread this information. I would like to see this person. Instead of constructing the dam of Belo Monte, why is President Dilma not taking care of the bandits of Rio de Janeiro and São Paulo and why does she not stop the destruction of the environment? Does she have no authority?